Chances are your new NOOK Tablet will arrive with not much of a charge in its electrical tank. And therefore, the first thing you want to do — after you open the box — is plug it in and put some juice in the battery. If you are really, really determined (impatient?) to try your new tablet as soon as it arrives, go ahead and turn on the power; if there’s not enough of a charge, the NOOK Tablet will either refuse to start or display a warning message. If you turn on your NOOK Tablet when its battery is almost gone, you get a warning to begin recharging before you try to use the tablet. If the battery is depleted, the tablet will shut down until it has been sufficiently recharged. The only officially sanctioned source of power for your NOOK Tablet is the AC adapter provided by Barnes & Noble. (It’s the same adapter that the NOOKcolor uses.) Although there’s nothing special about the adapter, the USB cable provided for the charger isn’t standard. However: You may be able to find a replacement AC charger and cable with identical specifications from a third party; check and double-check before using one. You can buy a car charger from B&N. 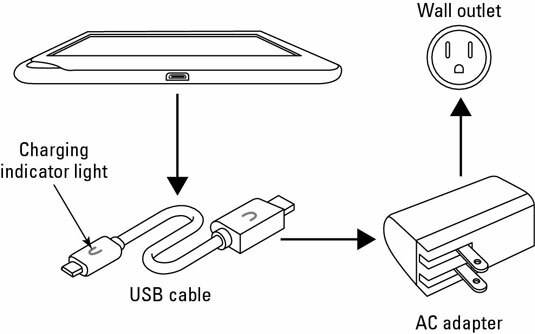 You can’t charge the NOOK Tablet using the power output of a USB port on a personal computer or laptop. Reading the blog entries on the Barnes & Noble website, it is apparent that more than a few owners of the original NOOKcolor felt that the construction AC adapter was lacking. The adapter and its cable are covered under the standard one-year warranty for the NOOK Tablet. If you have trouble in that first year, get in touch with customer care and politely insist on a replacement unit. Plug the large end of the USB cable into the right spot on the AC adapter. Plug the small end of the USB cable into your NOOK Tablet. Plug the power adapter into a compatible electrical wall outlet or power strip. The adapter can work with power between 110 to 240 volts; however, the plug is for use in the United States and Canada. You can connect your NOOK Tablet power adapter to a plug adapter, which would let you plug into a European or other foreign power source that uses a different plug shape. If your NOOK Tablet was turned off, it will turn itself on. The charging indicator light on the special USB cable lights up with an orange ∩ symbol. Depending on how much power remains in the battery, it might take as many as 4 hours to fully recharge your device; when the work is done the ∩ symbol on the cable turns green with gratitude. Don’t turn off the NOOK Tablet while it’s charging.